The new CD by The Tom Morton 2 A Complete and Utter History of Rock'n'Roll is available to buy HERE, online for just £7.99 plus postage. 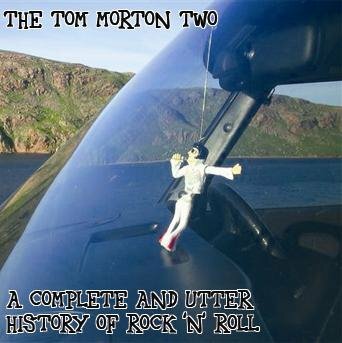 It contains 10 original Tom Morton songs, plus one secret bonus track. All you have to do is click HERE and you will be taken to my eBay shop. You can also listen to and download tracks from the CD, by going to my myspace page here. And for your delectation and delight, there are a couple of tracks to play here too. Please note, these are NOT CD quality, but have been encoded so they will play easily over dial-up connections. And second, a song for those of you who have always harboured suspicions about the Fab Four...oh yes: You Too Can Learn to Hate the Beatles. A Complete and Utter History of Rock'n'Roll; Learning to Hate the Beatles; The Ballad of Johnnie Notions; That's Braw! Driving for Love; Home for Christmas; Whelks; Dancing in a Minefield; Cars, Guitars and Alcohol; Downtown. Get more information HERE. You can buy the CD for £7.99 plus postage at The Bookcroft eBay shop, HERE. Now I'm smoking in a hurricane..."
They came from South Uist! He took our geese away...to Narnia! 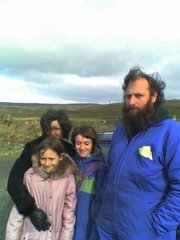 The first time I saw Malcolm, who's from Southampton, really, via South Uist, he was wearing a blue boiler suit (something I later found to be habitual) and therefore, with extremely large beard, looked more Zetlandic than a very Zetlandic, pre-Up Helly Aa male usually does. Given that it's well past Up Helly Aa time, and Malcolm ain't from these here parts, his appearance was initially puzzling. It was (and is) a padded blue suit, the mark of the true islander. At first I thought Malcom was like one of those early missionaries, and had deliberately donned the habit of the natives. But then I realised he always dressed that way. Obviously, He fitted in extremely well within the borders of the People's Republic of Northmavine. And earned our eternal gratitude by dealing with the geese, one of whom had become completely psychopathic, attacking cars, dogs, people and anything coloured red. Never mind bird flu, it appeared to have some form of rabies. Though it was not foaming at the beak. The geese have gone...to Narnia. Or Foula. Or Wick. These euphemisms are not for the benefit of any of the attendant children (they happily ate two of the geese two days ago) but for some sensitive adults of our acquaintance. Meanwhile, as swan fever sweeps Fife, wild geese mingle with domestic birds just along the road. At least, though, they're not shitting all over our now-gooseless garden. Nothing on earth shits as much as a goose. It's like a continuous shitting machine. When we came back from holiday, we could hardly get in the front door. It took a JCB four hours to clear the towering edifice of shite. Anyway. Malcolm, his wife Kate, and their children Maggie and Susannah were here on a flying Easter visit. On the whole, they reckoned Shetland was even colder than South Uist. And just as flat, if not flatter. I think they had a good time. I hope so. Kate and Susan, who are in the same line of business, had corresponded via email for five years without meeting. Wonderful, this internet business. And new stuff is happening every day. Check this out, oh ye folkies! Online sessions? Whatever next? No bodhrans, though. 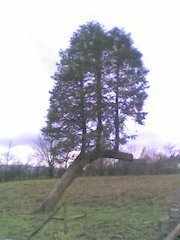 This bizarre triple-tree can be found on the back road to Balloch from Pirniehall. I'm tempted to say it's a trunk road, but that would be stupid. Because it isn't. Lumpy seas on the Peterhead-Orkney leg of the voyage home, but Phenergan once again negated the nausea. That and, in my case, an enormous meal of roast beef and Yorkshire pudding. Why do sea trips make me so hungry? Susan and Martha and her pal Holly had been up (and then down) Conic Hill near Balmaha, and then experienced what Susan said was "the best clootie dumpling ever" in the Oak Tree Inn. This is something which deserves serious investigation, as I am a serious clootie lover. Another time. Meanwhile, check out the links for news of Jimmy Carlyle's Shetland Folk Festival Podcast, which comes thoroughly recommended, and indeed The Shetland Folk Festival itself, at which young James and I will be performing under the name Johnnie and the Notions. Tingwall Hall is the place to be on the 28th of April. Yesterday, the commute (something new for me) from Drymen to Queen Margaret Drive in Glasgow went like this: lift to Balloch station (feeling miserable from some kind of gastric flu) train to Partick, subway to Hillhead, walk to QM Drive. Weirdly, but as is often the case, the show went particularly well despite general grogginess. I was loaded up on Immodium and Lucozade (which always tastes of being ill), and made the reverse trip back to our rented chalet near Loch Lomond in the midst of the rush hour. Trains heading west from Partick can be confusing: The Balloch train somehow nudged aside the Milngavie one which ought to have come first, leaving one lady who inadvertently got on the Loch Lomond Express stranded....in Dumbarton. Anyway, today I decided to cycle into Glasgow. There's a Sustrans national cycle route running from Drymen to Balloch, then onto Bowling and the Forth and Clyde Canal towpath all the way into the city. In total about 30 miles (by car it's only about 17)but obviously there was the fallback option of a train from Balloch if I felt in any way discombobulated. Which I did. It started badly with the discovery that that the bike I'd hired had hardly any bearings left in the rear hub. Not wishing to have the wheel disintegrate in the middle of Drumchapel, I went into Drymen to swop it over. The new bike had dodgy gears and a very strange saddle, which seemed calculated to cause maximum discomfort. Still, off I went. Against the wind, into the rain all the way from Pirniehall past Gartocharn,I soon began to dream of trains. But I wasn't sure if I could take the by now mud-caked Giant Boulder on with me. No problem. I skidded onto the Balloch platform (not so much a station as a park'n'ride for trains) and asked the guard if it was OK. "Best at the front - there's a long seat up there". There was, and soon I was luxuriating in Strathclyde Passenger Transport velour while we zoomed towards Glasgow. No extra charge for bikes, by the way. Off at Partick, a quick pedal, and I was ready for a terrible roll and sausage at the BBC tea bar. Not that I expected it to be terrible. But it was. So, I'm sitting, drookit as a very drookit thing, in Glasgow Central Low Level. I am wearing a second-hand Crombie overcoat, a large rucksack, and carrying two other bags. I surmise that I am not looking happy. It's 9.15 on a Friday night, and Glasgow is in party mode. I am waiting for a train to Milngavie. Three women of a certain age stumble cheerfully dfown the platform, dressed for serious hen-night action. They have balloons, their bellies are unwisely exposed. They are probably not from Milngavie. One of them pauses briefly before my bedraggled figure, a sympathetic smile on her face, and hands me a litre bottle of electric blue WKD vodka substitute brain damage inducer. Then she walks off, her good deed for the night apparently done. I become aware that other passengers are eyeing me warily. Suddenly, I feel myself becoming a down-and-out. All it takes is a rain shower, a beard and a rucksack, and thrift-shop cool turns into dishevelled homelessness. Briefly, I consider drinking the WKD, something I have never tasted. But in the end, as the Milngavie train pulls in, I leave it for someone whose need for oblivion is greater than mine.